« How strange and what a coincidence » would say the Martins in Ionesco’s The Bald-Headed Soprano. The RMN and the musée d’Orsay announced the great Monet retrospective two years ago, so it seems indeed curious that Jacques Taddei, an eminent organist and member of the Académie des Beaux-Arts, elected  director of the Musée Marmottan in the fall of 2007, is offering at the same time as the Galeries nationales du Grand Palais an exhibition Claude Monet, son musée, for the public to view the 169 canvases and drawings owned by the museum. Consequently, some of the works requested for the retrospective – Impression, Sunrise, Train in the Snow, The Locomotive, and The Europe Bridge – will selfishly remain at the Marmottan . We understand that Jacques Taddei wishes to act in the best interest of his museum. The fact that he prefers not to associate himself, in the form of a few justifiable loans, to the exhibition at the Grand Palais would seem however to be an abuse of power  and obviously does not rank him as a supporter of great cultural events, a role he aspires to play on the Parisian, even international stage. His denouncement in an arrogant, almost contemptuous tone of “the spectacular high masses of national retrospectives ” does nothing to convince us that Marmottan, no matter how beautiful its collection, is other than a “small museum” and is not a member of the circuit of major international establishments. Challenging the claim of the “entire Monet ” flourished by the Grand Palais, the Musée Marmottan vaunts “its entire Monet collection, the richest in the world”. Let us just say that a visit to Ranelagh presents no surprises for anyone already familiar with the museum : the canvases have been rearranged according to a thematic visit – “The caricatures”, “The portraits”, “Impression, Sunrise and the first landscapes”, “The trips” – which ends in the basement with a fantastic red explosion of versions of the Japanese Bridge, the Rose Bush Path, the Weeping Willow, and The House Seen from the Garden. Can we call this an exhibition with a purpose, an itinerary, a theme ? Most assuredly not : this is just a way of displaying all of the collection, period ! The exhibition at the Grand Palais is an entirely different matter. Despite the petty defections of the Marmottan – adroitly eluded by other canvases exploring the same subjects, such as the marvelous Sun Setting on the Seine, Winter effect (ill. 1) from the Petit Palais (rediscovered here), making it easy to forget the historic Impression, Sunrise  – this is indeed a visit through Monet’s entire career which the curators have organized around a significant point – the year 1890 when he acquired Giverny and settled there, abandoning his frequent wanderings around the country – outlining the tentative initial attempts, later more confident searching, and finally the uniquely personal manner of an artist whom Zola described admiringly by saying he had “an accurate and frank eye . There are therefore two large sections, opposing the inner and outer worlds. The latter covers the period between 1863 to 1865, during which Monet, along with other painters, spent time in the Fontainebleau forest, setting down his easel to seize Le Pavé de Chailly (ill. 2) on several occasions ; then the visits to Belle-Ile (1886) and the Vallée de la Creuse (1889), a place at times more a product of his imagination than reality ; as well as canvases started while in Venice (1908) but finished only at Giverny in 1912 and, of course, the various series – the Haystacks (1890), the Poplars (1891) and the thirty or so versions of the Rouen Cathedral (1892-1894) seen from three distinct viewpoints at different hours of the day – then finally the almost neurotic obsession of capturing nature in his garden at Giverny, from the Japanese Bridge to the Waterlilies – in an infinite variety of formats, angles and colours. 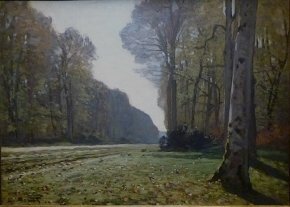 The very elegant and spacious setting designed by Hubert Le Gall offers ample breathing space for the paintings (and allows visitors to get a good look at them even on busy days), proposing a traditional itinerary through time – Monet attempted to draw the favors of the Salon and with this intention launched out in 1865 on an immense canvas measuring 6 x 4.65m. 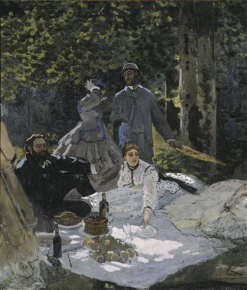 with twelve life-size figures : the Picnic, a double tribute to Manet and Courbet, who both went to see the work in progress and make suggestions, possibly explaining why the painting was never finished although two large fragments still exist at the musée d’Orsay (ill. 3) along with a reduced-size study from the Pushkin Museum in Moscow. 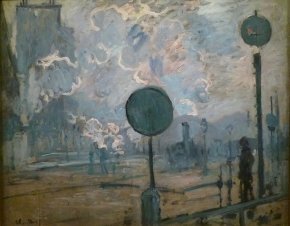 This was an attempt on Monet’s part to free himself from the overshadowing influences and artistic currents in place at the time. It is true that naturalism can be found in the canvases evoking Fontainebleau and the Normandy coast (The Seaside at Honfleur, 1864-1865, Los Angeles County Museum of Art) but this vein soon turned to a monochromatic presence dominated by gray (Heavy Seas at Etretat, 1869, Orsay) or else a snowy harmony of bluish white (The Magpie, 1869, Orsay) as if the perception of the subject were less important than the evocation of a certain atmosphere which, in the style of Baudelaire’s “Correspondances”, was the fruit resulting from a process of synesthesia. In fact, the same Normandy coast would also provide Monet the opportunity to use joyful colours in rendering a sunny afternoon (Terrace at Sainte-Adresse, 1867, New York, The Metropolitan Museum of Art), with an open perspective embracing the sea and the sky and only the shadow of the hotel on the left side of the terrace permitted in the picture. Over the next few years, before settling down in Vétheuil between 1878 and 1881, Monet goes around Paris and its outskirts capturing nature in the Ile de France region with its villages still anchored in a rural world (such as the magnificent The Seine at Bougival, Evening, 1870, Northampton, Smith College Museum of Art) or the splendid Poppies at Argentuil (1873, Orsay) but also the arrival of modernism which, like the train crossing the unchanging landscape in the distance, fuses the permanent and the ephemeral (Train in the Countryside, 1870, Orsay). In much the same way, the different versions of Bridge at Argenteuil (1874) convey the painter’s attraction to intrusive elements in the otherwise permanent serenity of nature. There is just a step from the belching trains crossing the countryside to the stations : and thus the Station at Argenteuil (1872, Cergy-Pontoise, Conseil Général du Val d’Oise) but especially the many canvases produced in and around the Saint Lazare station (ill. 4) where the steam from the engines provide Monet with artificial haze all day long, resulting in vapory cityscapes. We can easily understand how Zola loved these Parisian paintings : isn’t this after all the expression of what Richard Thomson calls “an emotional naturalism” , a term adapting Zola’s formula of “a corner of creation seen through a temperament ”. This “temperament” was to occupy an increasingly important place in Monet’s painting, sweeping away previous traditions. 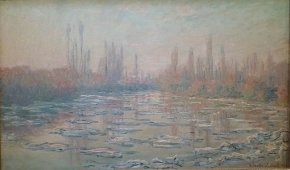 At Vétheuil he produces what can be considered a first try at a “series” with different versions of the winter debacle on the Seine in 1880, ending with Ice Floes on the Seine (ill. 5), where the ice drifts under the softened light like the waterlilies later in Giverny. 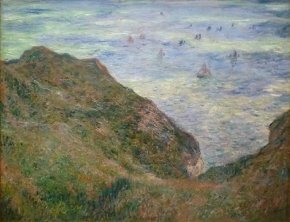 Monet’s touch becomes more confident over the following years, during another series of visits to Normandy (along with the coulours there is the choice of high-angle views – Cliffs at Pourville (ill. 6) or Clear Weather (New York, The Museum of Modern Art) -, or seen from below –The Cliffs at Dieppe (1882, Zurich, Kunsthaus) and (unfortunately missing in the exhibition) The Church of Varengeville where Monet’s brush seems to distort the cliff and the chapel much like Van Gogh – or where he zooms in – the extraordinary Manneporte of 1883 (New York, The Museum of Modern Art), a canvas in which Monet plays with the stark contrasts between the sky, the waves and rocks to create a unique artistic whole. Two visits to the Mediterranean (1884 and 1888) afford him the chance to open his palette to previously unexplored shades (At Cap Martin, 1884) and to capture, as in Vétheuil, a landscape at different moments of the day (Antibes Seen from La Salis, 1888, Toledo, Museum of Art) and Antibes, Morning (1888, Philadelphia, Philadelphia Museum of Art). In between, he has the time to go to Britanny, Belle-Ile (1886) where he paints the rocks while elevating the horizon so that the light can play more openly on the waves and rocks (The Côte Sauvage, Orsay ; The Rocks at Belle-Ile, Reims, Musée des Beaux-Arts ; Rocks at Port-Coton, the Lion, Cambridge, The Syndics of the Fitzwilliam Museum). In 1889, he travels to the Creuse, central France, resulting in the ruby tones of Creuse, Sunset, Colmar, Musée d’Unterlinden. Monet is in his fifties and an acknowledged artist when he distances himself from Parisian circles, amidst the countryside in Normandy which he loves so much, in the house at Giverny where he lived since 1883 and which he finally buys in order to fully enjoy his taste for the Japanese garden as well as to “dig […] so as to render instantaneity” . This is the great moment which marks the beginning of the “series” mentioned above. 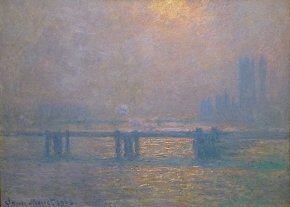 Even when he leaves his haven in the Eure department for three visits to London (1899, 1900 and 1901), Monet continues to “work stubbornly at a series of different effects .” applied this time to the buildings at Parliament or Charing Cross Bridge on the Thames (a series which is compared in an instructive way to the canvas from a previous visit in 1871, a canvas of life more than of the imagination, with Whistler-like tones : The Thames and Parliament, London, The National Gallery). And while he is in the process of becoming an “artist gardener”, digging another pond for his waterlilies destined for celebrity and spanned by a Japanese bridge covered in wisteria – “for painting motifs” he wrote to the Eure Préfect in 1893 -, Monet becomes “a slave to work, always looking for the impossible ”. While the world finds itself at war, in a custom-built workshop at Giverny, he executes his Grandes Décorations de Nymphéas which he donates to France and which will not be presented to the public until after his death, in two large oval roomsat the Musée de l’Orangerie  designed by the artist himself. “The Sistine Chapel of Impressionism ”, the Orangerie represents a demiurgic “creation” if we agree with Marcel Proust when he writes that the ninety-one meters covered by Monet’s twenty-two panels “harmonize [flowers and nature] in a blue and pink stretch, […] a powerful manifestation of the artist’s intent to dematerialize them of everything but colour ”. Collective work, Claude Monet 1840-1926, Editions de la RMN, 2010, 385 p., 50€. ISBN : 9782711856879. Noémie Goldman, Monet son musée, Hazan, 2010, 240 p., 35€, ISBN : 9782754104678. Visitor information : Galeries nationales du Grand Palais, 3 avenue du Général Eisenhower, 75008 Paris. Tel : +33 (0)1 44 13 17 17. Open every day from 10 am to 10 pm., Tuesdays until 2pm and Thursdays until 8pm. Tickets : 12€ (full price), 8€ (reduced rate. Musée Marmottan, 2 rue Louis Boilly, 75016 Paris. Tel : +33 (0)1 44 96 50 33. Open every day except Monday, from 11am to 6 pm, Tuesday evening until 9pm. Tickets : 9€ (full price), 5€ (reduced rate). It would seem, given the manner in which Jacques Taddei insists on his “election” as head of the Musée Marmottan that he wishes to claim a greater legitimacy than Guy Cogeval, “appointed” by the Conseil de Ministres. We should recall that M. Taddei’s election was made possible only because the probable winner withdrew at the last minute. 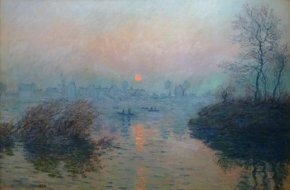 But Impression, Sunrise, will travel to Martigny, the Fondation Gianadda, in exchange for a fee next summer… And we should remember that for his inaugural exhibition, Monet. L’oeil impressioniste, Jacques Taddei had received 7 canvases generously loaned by the Musée d’Orsay. An abuse of power which he manifested as soon as he took over his office by dismissing the museum’s three main collaborators. Jacques Taddei, catalogue for the exhibition, Claude Monet, son Musée, Hazan, p. 9. Concerning the 1880 canvas, Monet wrote to Théodore Duret : “I’m working hard on three large canvases of which only two are for the Salon since one of them is too much to my own liking”. Sylvie Patin correctly points out that this can be read as a replica in large format of Impression, Sunrise of 1874. Richard Thomson in the catalogue for the Monet exhibition, RMN/Musée d’Orsay, pp. 33-47. Emile Zola, “Proudhon et Courbet”, I, in Mes Haines, published in Le Salut Public, 26 and 31 August 1865. Letter to Gustave Goeffroy, 7 October 1890. Letter to G. Bernheim Jeune, 3 August 1918. A package ticket includes the exhibition at the Grand Palais and the Waterlilies at the Orangerie. André Masson, “Monet le fondateur”, Revue Verve, 1952. Marcel Proust, « les Eblouissements par la Comtesse de Noailles », Le Figaro, 15 June 1907.